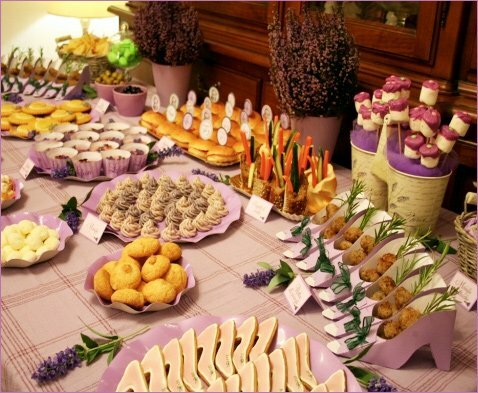 Today’s Real Party features a lovely lavender theme and was dreamed up by the ultra-creative Ilenia of Simply Nabiki for her mother’s birthday celebration. 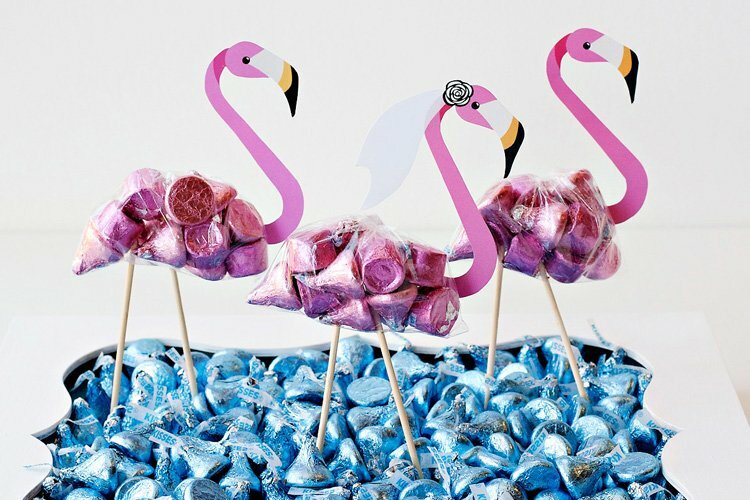 Color parties always offer lots of versatility, and this one is full of chic, stylish ideas (and mouth-watering treats!) 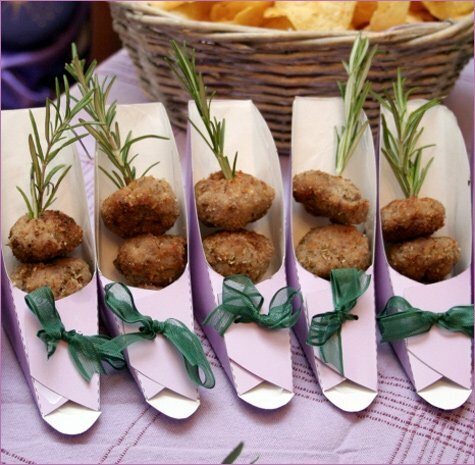 that would also be perfect for occasions like Mother’s Day or spring bridal showers! 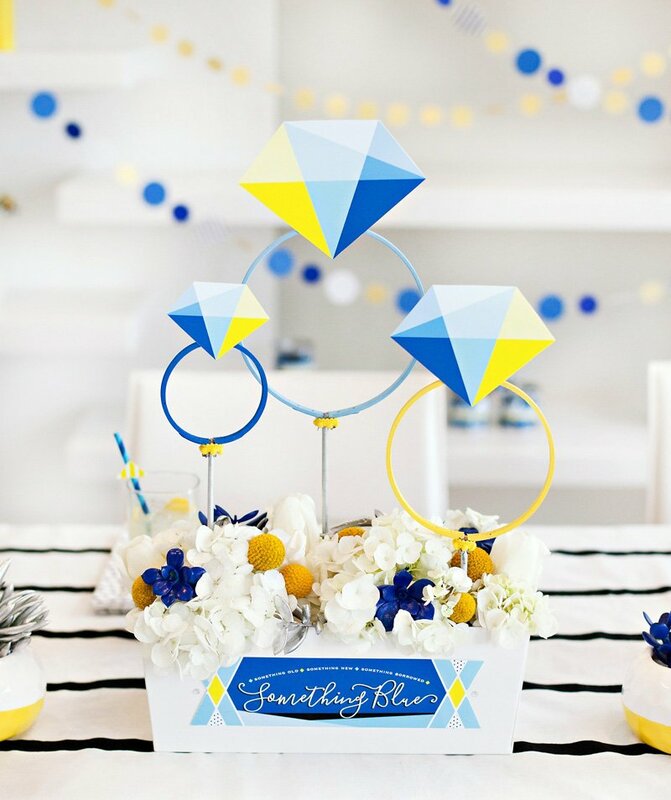 “I was really happy with how this party turned out – and one of the best things was that for the first time my mother didn’t have to tire herself out with all the preparation. Since she didn’t have to worry about doing anything during the party, she was actually able to really enjoy it! At the contrary, I was completely exhausted, but still happy! The buffet included both salty and sweet food (as always!). 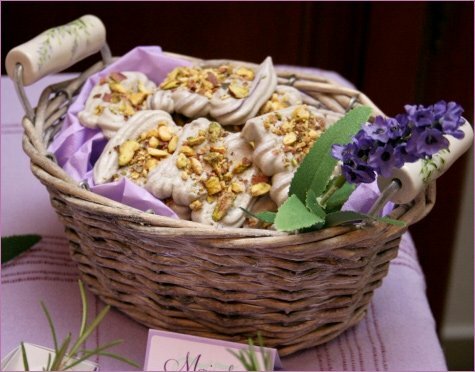 I made some lavender paper cones to use as creative holders for the forks & napkins and served pistachio meringues (see image #2, above) in a provenzal basket. 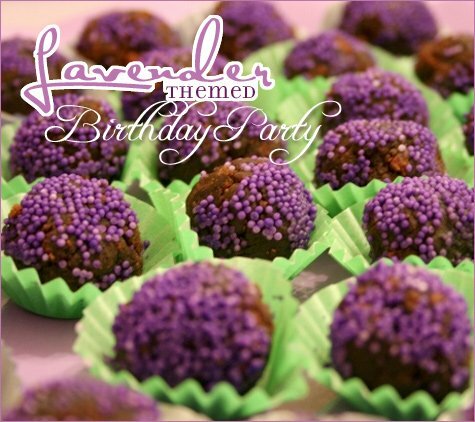 I also made chocolate cake balls rolled in lilac nonpareils (see image #1, at top) and some little french hat cookies. Hats and shoes are two of my mother passions, so I thought it would be fun to incorporate both of them into the food! 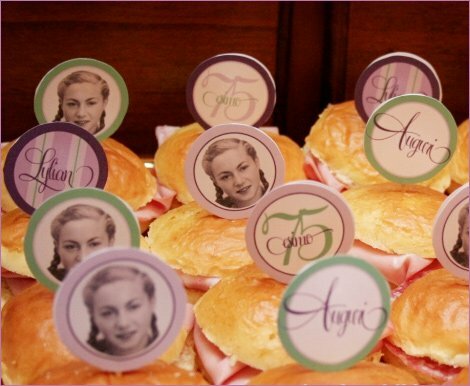 I also made some some lilac & green party picks to decorate the mini sandwiches. Last but not least… a salty “cake” for mom! What a lovely table. The paper shoes are my favorite, I hadn’t seen those before. Thanks for sharing! Love the paper shoes. 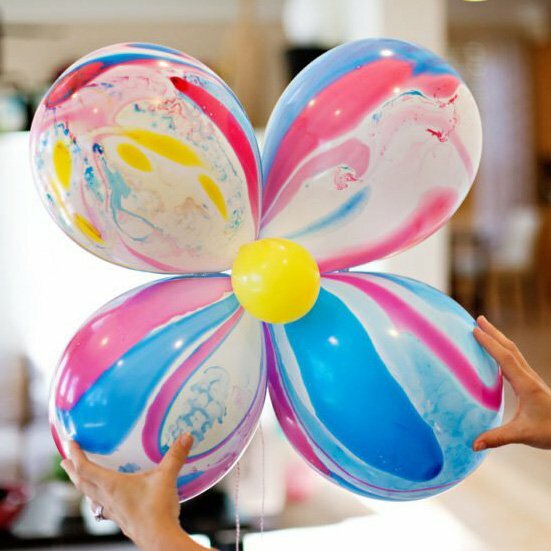 I could see those at many different parties or even a bridal shower. 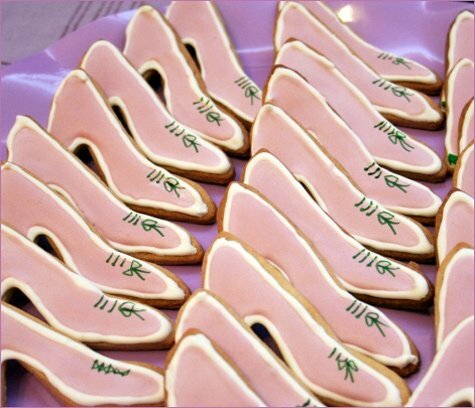 the shoe cookies are amazing! Very sweet! I love the food in the shoes! That’s a gorgeous and delicious looking spread! I totally want cupcakes and cookies in the shape of shoes! Such great details! Can’t wait to try and make those paper shoes! This could be my favorite party theme so far!! Love it! What a beautiful and well-thought out party. 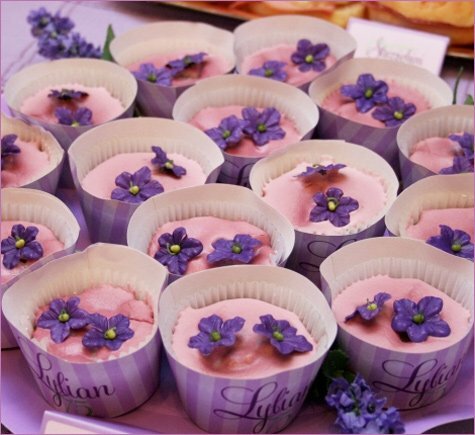 I love the lavender and purple colours and particularly the shoes – they add a fun element to the elegant setting. I love this theme! So feminine and sweet! 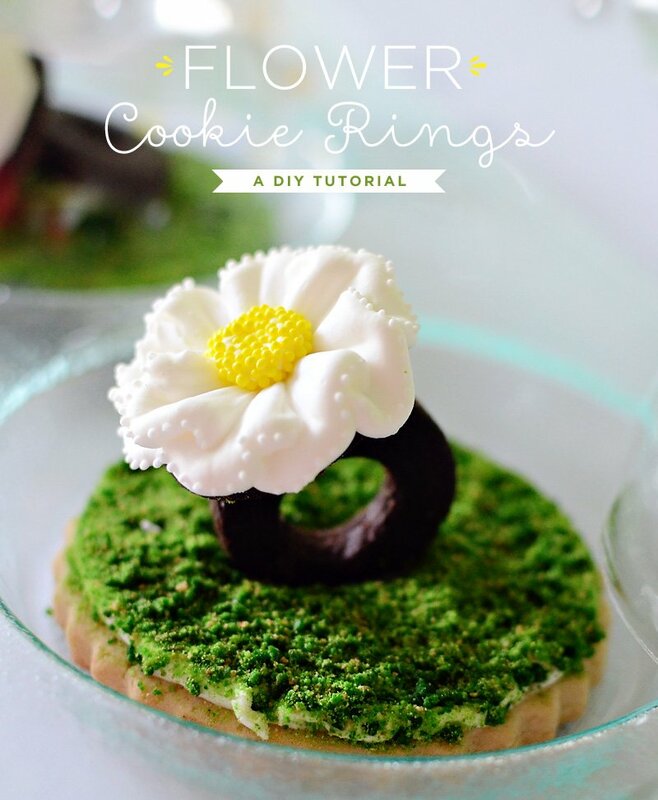 For us novices though… I’d love the recipes, places to buy, and instructions on how to make some of the items! How cute are those hat cookies! 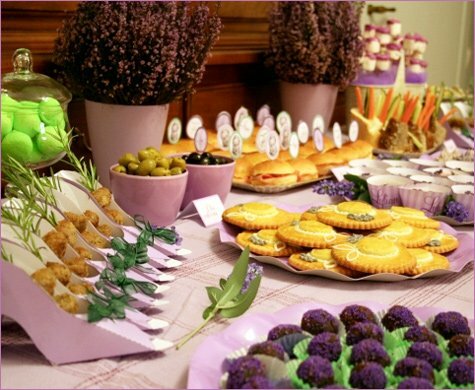 I love that the decor, food, and favors are centered around lavender. What a great way to incorporate color, texture, and scent. 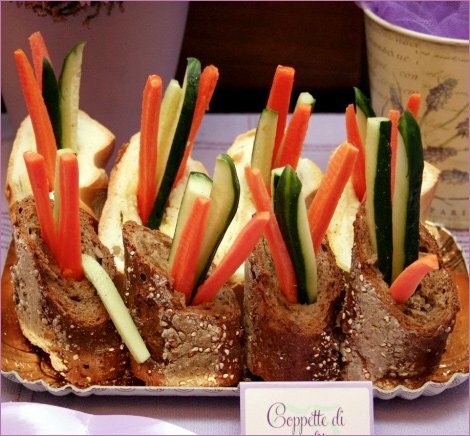 This could easily be a bridal shower! Oh my goodness, what a lucky mom + a talented daughter! 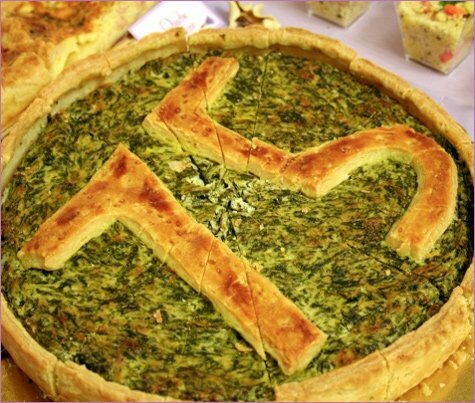 I wish i could pick out a fave detail, but there’s so much to love — the 75 in the spinach “cake,” the shoes + the meatballs on the rosemary!, the cake cookies, just everything! This is definitely getting bookmarked for ideas for me in the future :)! So many thoughtful touches! Would be perfect for a bridal show, mother’s day celebration, baby shower even a spa party as it looks so nice and relaxing! Everything is beautifully presented and you can tell a great deal of love went into this celebration, that has to be the best gift of all! 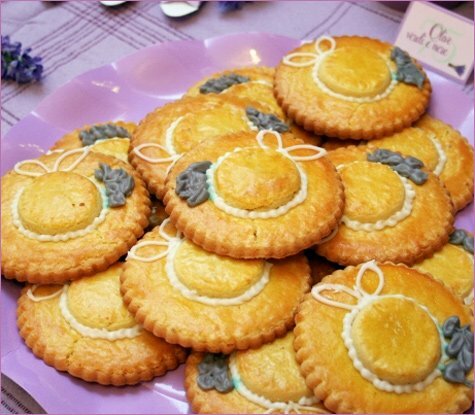 I am head-over-wife-heels for the FRENCH HAT Cookies! How creative and cute! It is all in the details! You did it again, hon. I have to admit I’m getting addicted to your blog. By the way, the sight of those lilac non-pariel coatings on the round cookies made me drool onto my keyboard…is that wrong? Then I don’t wanna be right. Wow–these details are blowing my mind. They had me at the blueberry stirrers! 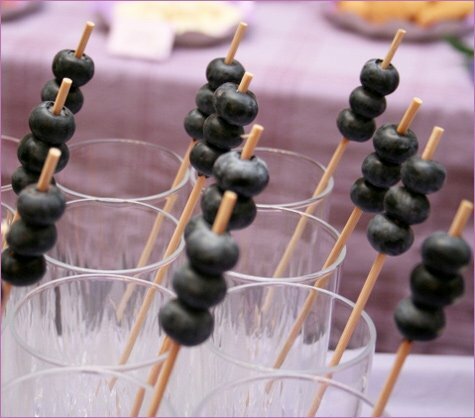 What a great idea to use blueberries to decorate the drink stirrers. Simple and sweet! Anne and N.Dales: Agree. The blueberries are a great touch. I love organic decorating. I think it’s very upscale (interestingly) and creative. Excellent . 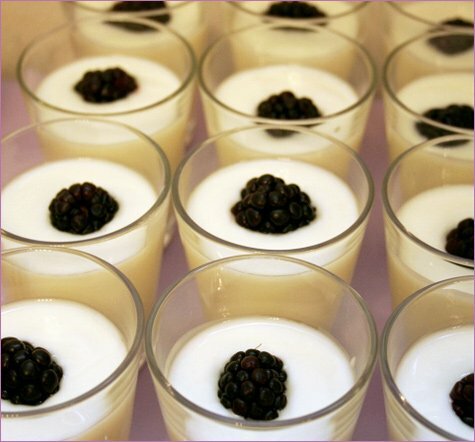 I love the decors of those foods . Wonderful work . 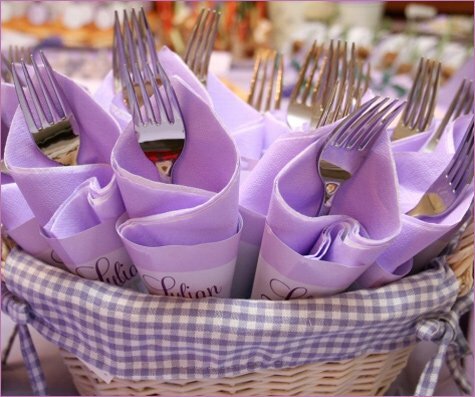 Your website rocks – wish I had seen this lavender theme last month! 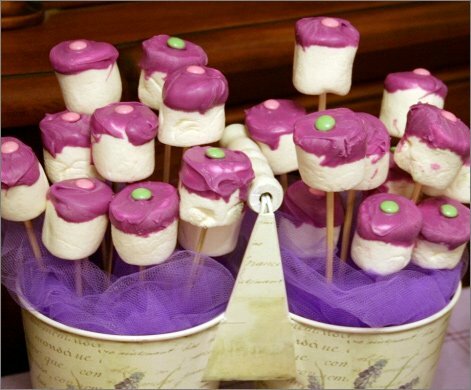 Still, I found plenty of inspiration on your site for my Irish baby shower last month. Absolutely lovely! 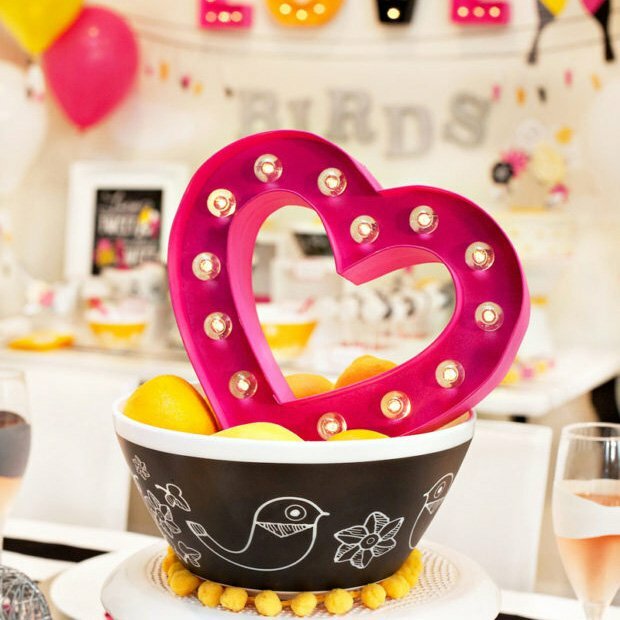 My customers will love your ideas and all the creative things they can do with their own parties. Just beautiful! Hosting a Bridal Shower in June for my neice. Would love the recipes. 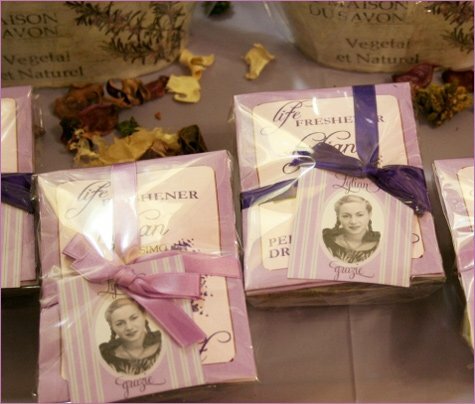 Love the lavendar theme. 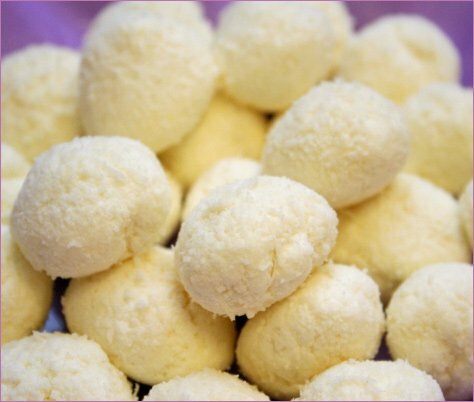 Are those Cake Balls? Really cute! I am so glad that lavender is in this season. All different shades of purple all together are stunning. I love the blueberry drink stirrers. The favors are awesome!! 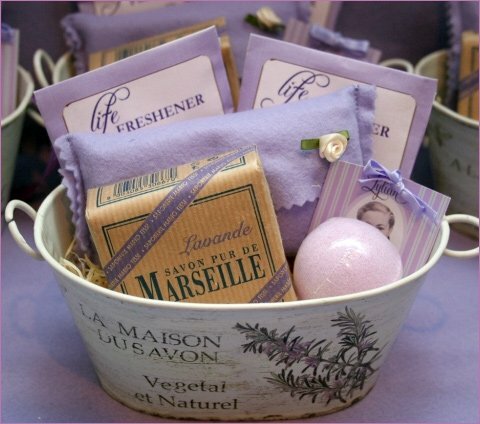 Where did you get the little baskets the soaps are in?